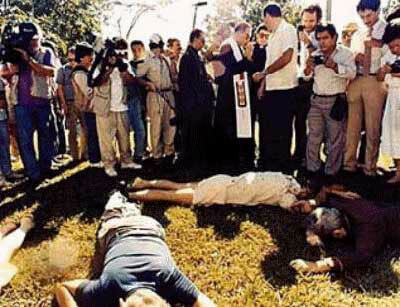 November 16, 2008 will be the 19th anniversary of the assassination of the Jesuits, one of the most notorious crimes of El Salvador's civil war. In 1989, as FMLN guerillas were making an offensive into the heart of San Salvador, elite Salvadoran troops entered the University of Central America and killed six outspoken Jesuit priests: Ignacio Ellacuría, Rector of the University; Ignacio Martín-Baró, Vice-Rector; Segundo Montes, Director of the Human Rights Institute; and Amando López, Joaquín López y López and Juan Ramón Moreno, all teachers at UCA. In addition, the troops killed the Jesuits' housekeeper and her young daughter. Today came the news that human rights advocates have brought suit in Spain against former Salvadoran president Alfredo Cristiani and 14 military officers for the Jesuits' murder. The Association for Human Rights of Spain, supported by the Center for Justice and Accountability based in San Francisco have filed the proceeding on behalf of Alicia Martín-Baró, a Carmelite nun and sister of one of the victims. The suit accuses Cristiani of covering up crimes against humanity and accuses the military officers of being the material authors of assassinations amounting to crimes against humanity. Spain is asserted to be an appropriate jurisdiction for this human rights case because 5 of the victims were Spaniards. Although there was a trial of various low level officers for the murders, the military leadership who ordered the silencing of the Jesuit voices have never been held accountable for their actions in any forum. For more information about the Jesuits case, some good sources are the UN Truth Commission report, the PBS video, Enemies of War, and the extensively researched book Paying the Price. The attacks on the Jesuits was reputed to be in retaliation for an attack on the home of Ricardo Valdivieso, known as "El Gringo", then the vice-minister of foreign affairs. (see http://query.nytimes.com/gst/fullpage.html?res=950DE1DD1339F93AA25752C1A96F948260&sec=&spon=&pagewanted=all). He is still actively involved as a party functionary in the ARENA party today.......the same people are still running the country. And that goes for the FMLN, too: Sanchez Ceren was a very bad boy. must be held accountable for their crimes for as long as they live. Spain has been chosen not simply "because five of the victims were Spaniards". Since 2004, the CJA has promoted three CIVIL cases against one captain involved in the assassination of Monsignor Romero, one ex vice-minister of defense and two ex ministers of defense accused of the higher responsibility for various crimes committed during the war. As the CJA international attorney has stated, Spain was chosen for two legal reasons which are not present in the US: a) In Spain they can open a CRIMINAL case in a criminal court; and b) There are existing extradition agreements between Spain and El Salvador. And there is also the precedent created with the arrest of Chilean ex dictator Augusto Pinochet. I think the CJA is baying at the moon. I don't think the El Salvadoran government is going to allow their sovereignty to be usurped by a bunch of left wingers from Spain. While I don't condone murder of any kind I thought that the amnesty said that all sides were involved in dirty business and for the good of the country it would be best to let bygones be bygones. Like anonymous says Sanchez Ceren and Merino and all the rest were as dirty as the rightests. You wouldn't want to steal the vice presidential candidate from the FMLN for a few lousy murders. I have neighbors that were held hostage while the FMLN cowards shot at govt helicopters trying to draw fire on innocents so the communists could claim the govt troops were marauding. That is straight up behavior! Besides as a heretic I have to say that if the Jesuits were involved, as they probably were in guerilla war, they have the lives of the innocents involved on their hands just as much as the guys that pulled the triggers. There are few clear cut whites and blacks in this country just a lot of shades of grey. What is needed here is a corruption bomb that could be detonated at 100,00 feet that would throw out anti-corruption radiation and take out anyone that had a smudge on their character. The only problem is that it would probably take me as well. None of us are perfect. RE: "None of us are perfect." No, but most of us have not killed unarmed priests. and mutilating their bodies by shooting the heads off at close range with assault rifles and then trying to cover the whole crime up. Heretic: What about the Sumpul River massacre, the El Mozote massacrre, and the scores if not hundreds of other massacres committed by the Government of El Salvador's "Security Forces". Heretic rolls out the standard baseless accusations drawn from U.S. counterinsurgency, special warfare, unconventional warfare-doctrine about the use of human shields by the FMLN. Did the UN Truth Commission find any substantive evidence to support such accusations? The answer is no. So, Heretic, go back to Soldier of Fortune magazine copies from the 80s--where you apparently get your information--when Larry Claflin and company were writing about "killing Gs" and letting God Sort 'em Out, and don't litter this blog with SOF-style fantasizing about El Salvador's civil war and the fundamental responsibility of the Salvadoran military and security forces (with U.S. assistence) in the vast majority of violations of the law of armed conflict and human rights violations. I have Salvadoran friends who have testifed in court--and won million dollar settlements--against the cruel murderers and torturers that were the final decision makers in the Salvadoran Armed Forces and in their personal suffering: two perpetrators by name are Generals Jose Guillermo Garcia and Carlos Eugenio Vides Casanova. Casanova has even been forced to cough up a few hundred grand in response to the settlement. I hope the same fate befalls the Salvadoran military higher-ups who orchestrated the Jesuits deaths when they get their day in court, even if it is not a Salvadoran court room. E.S. has signed, and willy nilly continues to sign, all kinds of international "treaties" that now bind it, such as the ICC. Most of these "treaties" are in reality tools of international socialism to impose their agenda via a body of doctrine not voted popularly in any one country. Sadly, this lawsuit is not being filed with the ICC. It would be beautiful to see a few Salvadorean government officials tried, convicted, and jailed for so stupidly having signed pretty much anything and everything that has been put under the noses. They have given away our sovereignty. Were the U.S. courts that found Casanova, Garcia, and Carranza guilty--of crimes against humanity (for the latter) and command responsibility for torture (the two former)--part of a plot of "international socialism" to wrest sovereignty from El Salvador? Unlikely. Rather, justice caught up with three unrepentent criminals. No se puede tapar el sol con el sucio dedo. Delusions of international socialism behind every act of the administration of justice befits more the paranoid view of history rather than the interpretation of historical facts based on concepts of fairness and of justice. What does any government that respects human rights have to fear from the International Criminal Court?